Part-whole relations seem like a never-ending story—and it still doesn’t bore me. In this case, the ingredients were the taxonomy of part-whole relations  and a couple of foundational ontologies and the aim was to link the former to the latter. But what started off with the intention to write just a short workshop note, for seemingly clear and just in need of actually doing it, turned out to be not so straightforward after all. 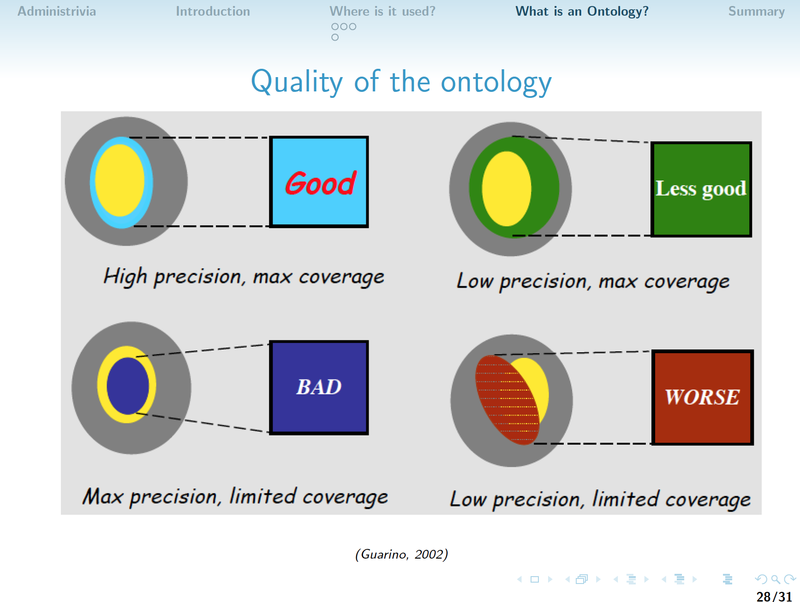 The selected foundational ontologies were not as compatible as assumed, and creating the corresponding orchestration of OWL files was a ‘non-trivial exercise’. What were (some of) the issues? On the one hand, there are multiple part-whole relations, which are typically named differently when they have a specific domain or range. For instance, to relate a process to a sub-process (e.g., eating involves chewing), to relate a region to a region it contains, relating portions of stuff, and so on. Those relations are fairly well established in the literature. What they do demand for, however, is clarity as to what those categories really are. For instance, with the process example, is that to be understood as Process as meant in the DOLCE ontology, or, say, Process in BFO? 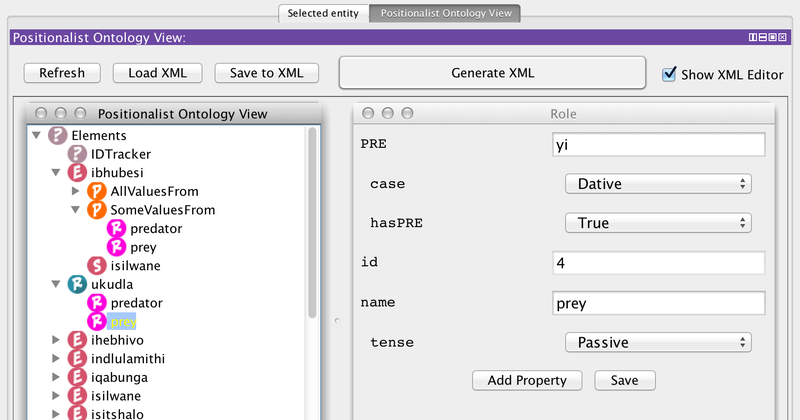 What if a foundational ontology does not have a category needed for a commonly used part-whole relation? The first step to answer such questions was to assess several foundational ontologies on 1) which of the part-whole relations they have now, and which categories are present that are needed for the domain and range declarations for those common part-whole relations. I assessed that for DOLCE, BFO, GFO, SUMO, GIST, and YAMATO. This foundational ontology comparison is summarised in tables 1 and 2 in the paper that emanated from the assessment , entitled “A note on the compatibility of part-whole relations with foundational ontologies” that I recently presented at FOUST-II: 2nd Workshop on Foundational Ontology, Joint Ontology Workshops 2017 in Bolzano, Italy. In short: none fits perfectly for various reasons, but there are more and less suitable ontologies for a possible alignment. DOLCE and SUMO were evaluated to have the best approximations. It appeared at the workshops presentation’s Q&A session, where two of the DOLCE developers were present, that the missing Collective was an oversight, or: the ontology is incomplete and it was not an explicit design choice to exclude it. This, then, would make DOLCE the best/easiest fit. I’ll save you the trials and tribulations creating the orchestrated OWL files. The part-whole relations, their inverses, and their proper parthood versions were manually linked to modules of DOLCE and SUMO, and automatically linked to BFO and GFO. That was an addition of 49 relations (OWL object properties) and 121 logical axioms, which were then extended further with another 11 mereotopological relations and its 16 logical axioms. These files are accessible online directly here and also listed with brief descriptions. While there is something usable now and, by design at least, these files are reusable as well, what it also highlighted is that there are still some outstanding questions, as there already were for the top-level categories of previously aligned foundational ontologies . For instance, some categories seem the same, but they’re in ‘incompatible’ parts of the taxonomy (located in disjoint branches), so then either not the same after all, or this happened unintentionally. Only GIST has been updated recently, and it may be useful if the others foundational ontologies were to be as well, so as to obtain clarity on these issues. The full interaction of part-whole relations with classical mereology is not quite clear either: there are various extensions and deviations, such as specifically for portions [4,5], but one for processes may be interesting as well. 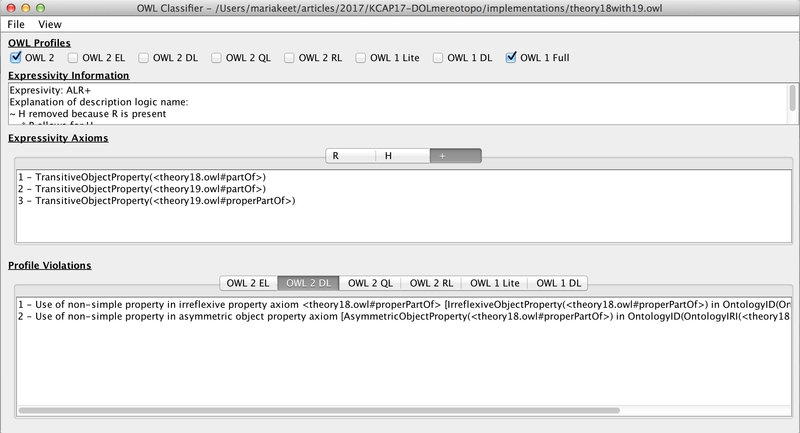 Not that such prospective theories would be usable as-is in OWL ontology development, but there are more expressive languages that start having tooling support where it could be an interesting avenue for future work. I’ll write more about the latter in an upcoming post (covering the K-CAP 2017 paper that was recently accepted). On a last note: the Joint Ontology Workshops (JOWO 2017) was a great event. Some 100 ontologists from all over the world attended. There were good presentations, lively conversations, and it was great to meet up again with researchers I had not seen for years, finally meet people I knew only via email, and make new connections. It will not be an easy task to surpass this event next year at FOIS 2018 in Cape Town. Donnelly, M., Bittner, T. Summation relations and portions of stuff. Philosophical Studies, 2009, 143, 167-185. Keet, C.M. Relating some stuff to other stuff. 20th International Conference on Knowledge Engineering and Knowledge Management (EKAW’16). Blomqvist, E., Ciancarini, P., Poggi, F., Vitali, F. (Eds.). Springer LNAI vol. 10024, 368-383. 19-23 November 2016, Bologna, Italy.